Either north or south of Goose Pasture Rd., hike the picturesque Aucilla Sinks Trail (part of the Florida National Scenic Trail) along the wooded Aucilla River, which disappears underground and re-emerges again and again. The trail traverses a portion of the 50,471-acre Aucilla WMA. As you wander the trail through this beautiful hardwood forest of hickories, oaks and magnolias, past pockets of flatwoods and pools of swirling water, listen for Wood Thrushes, Swainson’s Warbler, Kentucky Warbler and Hooded Warblers, all of which breed in the area. Look for Red-shouldered Hawk, River Otter, and Bobcat all year, and Winter Wren, Blue-headed Vireo and Golden-crowned Kinglet in winter. Great Crested and Acadian Flycatchers are present during the summer months and flocks of migratory songbirds may be encountered during spring and fall. 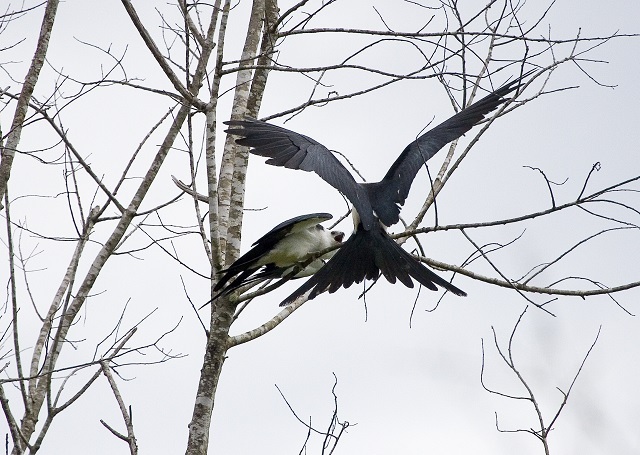 Be sure to visit in July and August when Swallow-tailed Kites gather in the bald cypresses before heading to Brazil for the winter. The Florida National Scenic Trail is open to hikers all year, but wear blaze orange for safety during hunting seasons; please click here for information about hunting dates.